Dofetilide is a selective potassium channel ((hERG)) blocker, used as a Class III antiarrhythmic drug. Chlorpromazine HCl is a dopamine and potassium channel inhibitor with IC50 of 6.1 and 16 μM for inward-rectifying K+ currents and time-independent outward currents. Low-micromolar amounts of chlorpromazine inhibit SARS-CoV-induced cytopathology. Vero E6 cells in 96-well plates were infected with SARS-CoV isolate Frankfurt-1 (MOI, 0.005) in the presence of 0 to 16 μM CPZ (B), given at t of +1 h p.i. Cells were incubated for 3 days, and viability was monitored using an MTS assay. In parallel, potential compound cytotoxicity was monitored in mock-infected Vero E6 cells. Graphs show the results (averages and SD) of a representative experiment that was performed in quadruplicate. All experiments were repeated at least twice. For each compound, the EC50, CC50, and SI values are given. Glimepiride is a potent Kir6.2/SUR inhibitor with IC50 of 3.0 nM, 5.4 nM, and 7.3 nM for SUR1, SUR2A and SUR2B, used in the treatment of type 2 diabetes mellitus. (E) ELISA analysis for C-peptide levels in the presence of vehicle, diazoxide and glimepiride. (F) The fold change of C-peptide content after diazoxide and glimepiride stimulation. Diazoxide and glimepiride decreased and increased C-peptide secretion in wild-type and heterozygous mutated cells, respectively. Neither diazoxide nor glimepiride had an effect on homozygous mutated cells. TRAM-34 is a selective and potent inhibitor of the intermediate-conductance Ca2+-activated K+ channel (IKCa1, KCa3.1) with Kd of 20 nM, 200- to 1500-fold selective over other ion channels, and does not block cytochrome P450. Tetraethylammonium bromide is used as the source of tetraethylammonium ions in pharmacological and physiological studies, but is also used in organic chemical synthesis. It blocks selective potassium channels. Oxypeucedanin is a major coumarin aglycone that can be extracted from Ostericum koreanum. It is a kind of open-channel blocker of the hKv1.5 channel. Talatisamine, a delphinine type alkaloid extracted from Aconitum talassicum, is a newly identified K+ channel blocker with hypotensive and antiarrhythmic activities. 4-Aminopyridine (4-AP) is a potent and non-selective inhibitor of voltage gated potassium channels (Kv) with IC50 values of 170 μM and 230 μM for Kv1.1 and Kv1.2 in CHO cells, respectively. Repaglinide is a potassium channel blocker, which lowers blood glucose by stimulating the release of insulin from the pancreas, used the treatment of type II diabetes. Quinine HCl Dihydrate is a white crystalline K+ channel blocker, used to treat malaria. Glyburide (Glibenclamide) is a known blocker of vascular ATP-sensitive K+ channels (KATP), used in the treatment of type 2 diabetes. Tolbutamide is an inhibitor of potassium channel, used for type II diabetes. Dronedarone HCl is a multichannel blocker targeting potassium channel, sodium channel and calcium channel, used as an antiarrhythmic drug for treatment of atrial fibrillation (AF). Results of hit validation experiments for these four compounds for animals treated at L1 stage at four different concentrations (0.5, 5, 25, and 50 μM). The blue bars represent the values obtained from the original screen as reference points. Error bars are standard error of the mean. Statistical significance for all different doses for individual compounds was calculated with respect to the lowest concentration using two-tailed, t-test (nZ70 animals except n = 37 for Geld 25 μM). The statistical significance values are represented as P<0.05 (*) and P<0.005 (**). Nateglinide is an insulin secretagog agent that lowers blood glucose levels by stimulating insulin secretion from the pancreas. 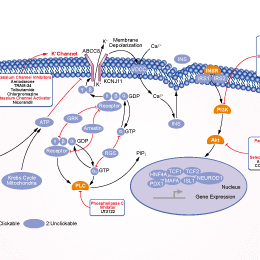 Vonoprazan Fumarate (TAK-438) is a novel P-CAB (potassium-competitive acid blocker) that reversibly inhibits H+/K+, ATPase with IC50 of 19 nM (pH 6.5), controls gastric acid secretion. Phase 3. ML133 HCl is a selective potassium channel inhibitor for Kir2.1 with IC50 of 1.8 μM (pH 7.4) and 290 nM (pH 8.5), has no effect on Kir1.1 and weak activity for Kir4.1 and Kir7.1. Gliclazide is a whole-cell beta-cell ATP-sensitive potassium currents blocker with an IC50 of 184 nM. Doxapram HCl inhibits TASK-1, TASK-3, TASK-1/TASK-3 heterodimeric channel function with EC50 of 410 nM, 37 μM, 9 μM, respectively. Mitiglinide Calcium is a blood glucose-lowering drugs, stimulating insulin secretion by closing the ATP-sensitive K+ channels in pancreatic beta-cells. Nicorandil is a potassium channel activator, and stimulates guanylate cyclase to increase formation of cyclic GMP (cGMP). (G) The fold change of C-peptide content after octreotide, nicorandil and nifedipine treatment. Octreotide, nicorandil and nifedipine decreased insulin secretion in wild-type, heterozygous mutated and homozygous mutated cells. Hydralazine HCl is a hydrochloride salt of hydralazine, which is a direct-acting smooth muscle relaxant used to treat hypertension by acting as a vasodilator primarily in arteries and arterioles. Diazoxide is a well-known small molecule that activates KATP channels in the smooth muscle of blood vessels and pancreatic beta-cells by increasing membrane permeability to potassium ions. Retigabine(free base) is a novel anticonvulsant with activity in a broad range of seizure models. The mechanism of action involves opening of neuronal K(V)7.2-7.5 (formerly KCNQ2-5) voltage-activated K(+) channels. Hexachlorophene is a potent KCNQ1/KCNE1 potassium channel activator with EC50 of 4.61 ± 1.29 μM; It can also attenuate Wnt/beta-catenin signaling through the Siah-1-mediated beta-catenin degradation. Retigabine is a novel anticonvulsant with activity in a broad range of seizure models. The mechanism of action involves opening of neuronal K(V)7.2-7.5 (formerly KCNQ2-5) voltage-activated K(+) channels. Gliquidone is an ATP-sensitive K+ channel antagonist with IC50 of 27.2 nM.